1) Be honest. Always, always, always tell the truth. It is so much easier and smarter than telling a little white lie because even if it means you won’t get the job, it cannot sneak up on you later. Many people have lost jobs because they weren’t honest from the get-go. 2) Do your research about the company and the position. Find out as much as you can about the company, its history, mission, and most importantly, its values. After reading the company website, ask friends and family if they know anything about the company and listen to their opinions and comments. Don’t forget; you want to work for a great company as much as great companies want great employees. Don’t waste your time on a fly-by-night charter company or one with a bad reputation or poor safety record. 3) Prepare to explain why you want the job. Don’t try to wing it because it might come off sounding trite or insincere. If you want to work for the company, you must have reasons for feeling that way. Think it over and write down every idea that comes to mind, like the company’s involvement in the community, its outstanding reputation, your positive personal experience with the company or an employee, etc. One of the smartest things you can do for yourself is to work for a company that shares your values and ethics, so don’t settle for less. 4) Prepare a description of why you are a great candidate for the position. As important as your experience may be, your personal attributes — like a friendly demeanor, professional appearance, and love for meeting new people — may give you the boost you need to rise above the other applicants. Be sincere and it will show. 5) Prepare in advance a real-life story about making an error and learning a lesson on the job. One very common interview question is the one about how you handled a mistake made on the job. Everybody has done it but under the gun in an interview, it can be tough to recall. Write down every incident you can remember and choose the one that shows you are responsible (i.e., you made a mistake, you owned it, and you fixed it). 6) Prepare to explain your greatest weakness and strength. Another very common question asks what you are best at and what you feel could most be improved, relative to the position. Again, this deserves some contemplation on your part so that you sound genuine, not like a braggart or someone entirely unsuited for the position (e.g., your greatest weakness is texting and driving). 7) Be prepared to show your credentials, licenses, records, and endorsements. Gather everything you have that could be essential to the position. 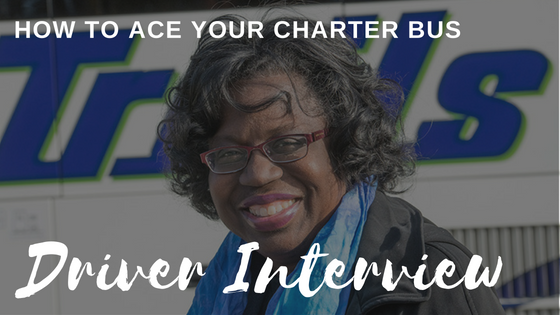 If you have a commercial driver’s license or a temporary operator’s permit, that shows you have experience and/or have made a commitment to becoming a charter bus driver by obtaining a CDL. It also proves you have passed the state’s stringent driver eligibility requirements including age, driving record, medical, vision, and the written and driving tests. 8) Be prepared to explain in detail your experience driving commercially. If you have been a charter or other type of commercial driver in the past, your experience is a plus. Make a list of the companies you have worked for, your title and responsibilities, and any awards or recognition you received. You may also be asked why you left (or would like to leave) so be prepared with a diplomatic answer, even if it’s the worst job you have ever had. Saying negative things about former employers makes you look bad, not them. 9) Be prepared to explain your mechanical knowledge of buses. As a driver and as the person in charge of the bus while on the road, the more you can say you know about your bus, the better. Even though you won’t be expected to handle mechanical needs yourself, having a generally thorough understanding of how they work can only be a feather in your cap. 10) If the company did not already ask you, prepare at least three references from people you have worked for or with and who have a good opinion of you and your abilities. Obviously, having an old boss give you a glowing letter of recommendation could make a big difference to your prospective employer when it comes down to deciding whether to hire you. If you are experienced or hoping to get training to become a charter bus driver, consider Indian Trails. We are one of the oldest and most respected bus transportation companies in the country and are always looking for great people to join our team. Find out more about careers at Indian Trails and how to apply today! Good luck!